Today's route of travel was a mere 361 miles according to Google Maps, and we got away from Williams an hour earlier than planned, despite the passenger door continuing to balk at unlocking in the cold. 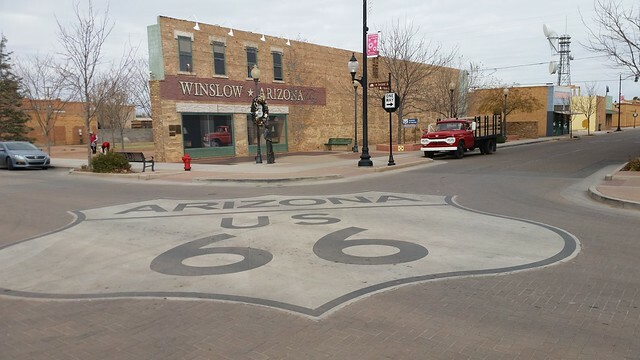 The likely high point of today's trip was a stop in Winslow, Arizona, and a look at the Standin' on the Corner Park, about which more in a minute. Interstate 40, on which we travelled most of today, parallels (and supplanted), Historic Route 66, the storied "Main Street of America." Many of the towns and cities through which US-66 passed I-40 bypassed, and those towns have faded badly, and many places have died entirely. 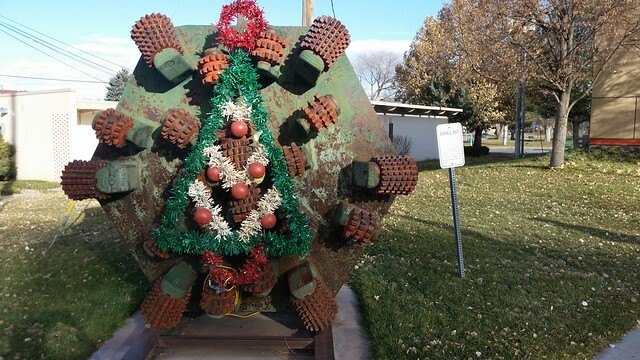 Winslow is trying gamely to attract people off the freeway. 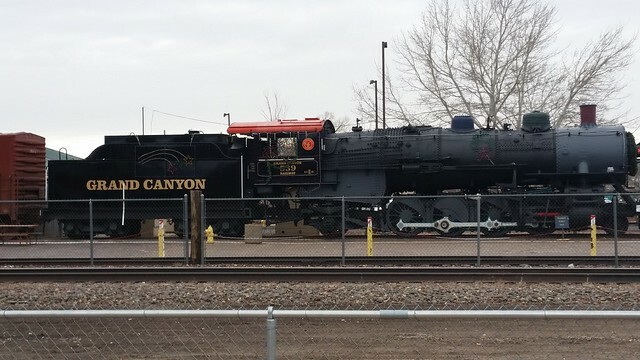 Before leaving Williams, though, we made a brief stop at the Grand Canyon Railway. As we left the hotel, we drove past the station for the Grand Canyon Railway, and while Lisa stayed in the van where it was at least above freezing while the heating tried to thaw us out, I jumped out to shoot a few pictures, like this of one of the GCR steam trains decorated for the holidays. 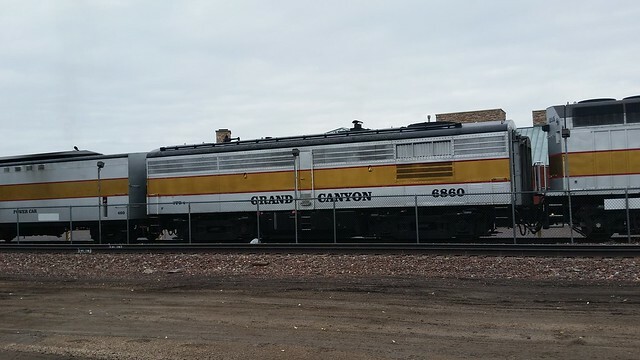 This former Amtrak F-40 locomotive would lead this morning's departure from Williams to the South Rim of the Grand Canyon. Trailing the ex-Amtrak unit was this relatively rare Alco FPB-4, a booster (cabless) locomotive that includes a steam boiler for heating the vintage railway equipment, no small matter on a morning like today when the temperatures were around -5°C. The rest of the train's consist includes dome cars. 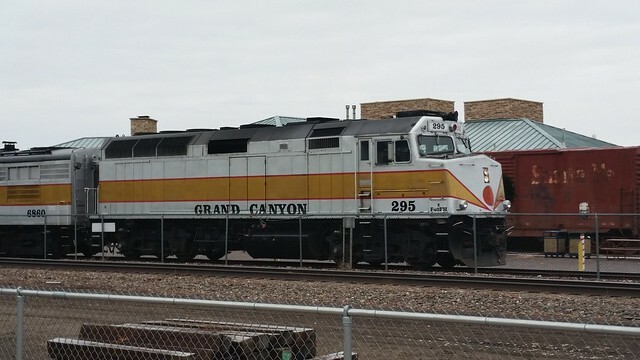 One of these days, Lisa and I want to come back to Williams and ride the train up to Grand Canyon, maybe even staying at the El Tovar Hotel at the South Rim, riding out one day and back on another, thus using the train as transportation, not just an amusement-park ride. 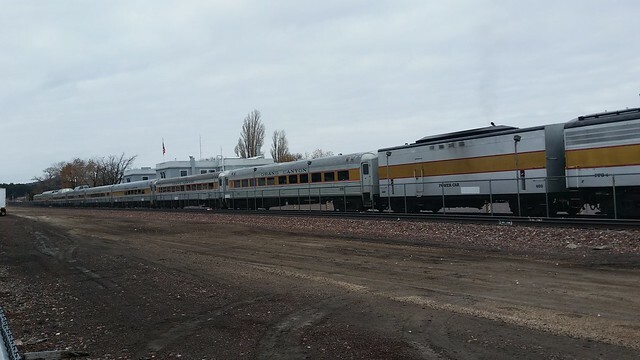 Whether we would actually take the train to Williams (Amtrak's stop is at Williams Junction, several miles away; passengers transfer to Williams by bus via a gravel road) or drive here and use the car to explore other parts of the area later, we aren't sure. After taking the train pictures, we got onto I-40 and headed east, with our usual stops at least once an hour or two. 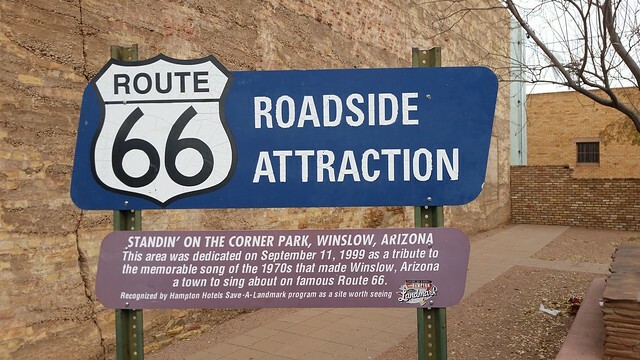 I drove us to Winslow, where we sought out the Standin' on the Corner Park based on the song "Take it Easy." This sign explains the park. I helped another group of people get a shot of them all together in front of the statue before taking my own picture of it and the painting behind it. Note the reflection of the vehicle in the "window" behind the statue. 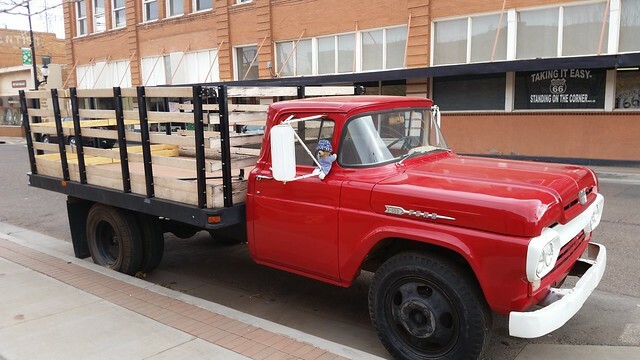 There is, in fact, a bright red flatbed Ford here. However, the girl who was slowing down appears to have stopped, parked, and gone away for a while. 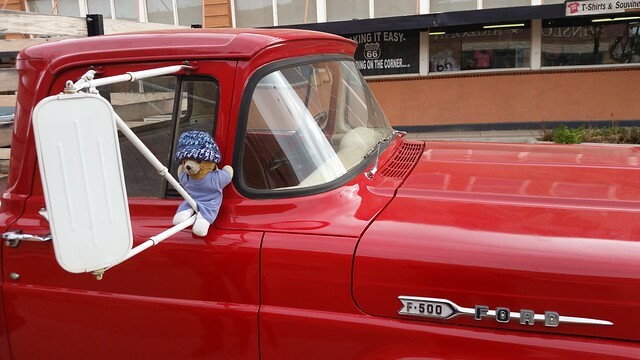 travelswithkuma took this chance to get into the act. Click through any of the photos above for more shots of the park. 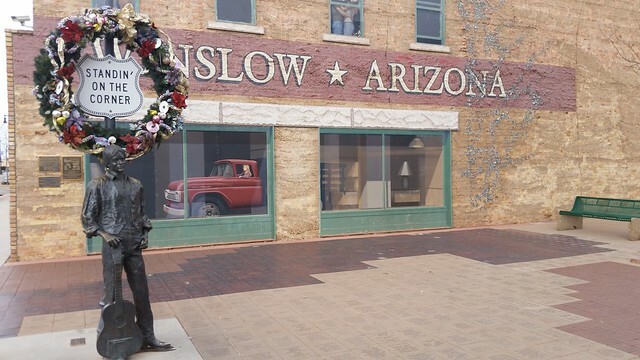 We did indeed spend some money traveling through Winslow, so the park did have some of its intended purpose. Lisa drove from Winslow to Gallup, allowing me to take a few pictures of interesting scenery as we passed through Northern Arizona. 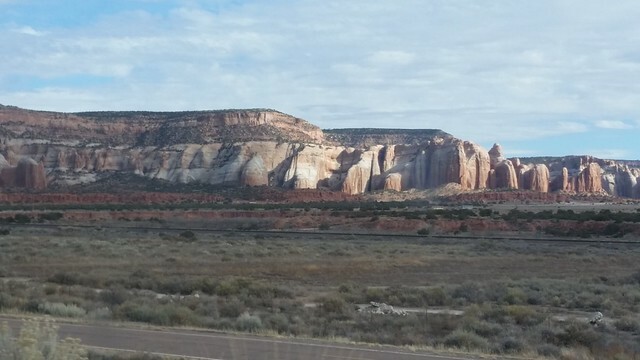 Interstate 40 goes through some spectacular scenery, including stretches of bloody conifers (waves to flick) and spectacular mesas, such as the one above (click through for some other shots) near the Arizona-New Mexico border. 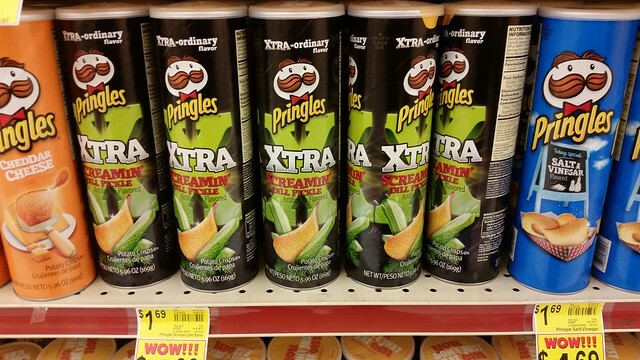 At Gallup, New Mexico, we stopped at a grocery store, where I discovered another cache of the evil Dill Pickle Pringles that I like but that are not easy to find in Northern Nevada. I bought all eight of them off the shelf here. We made sandwiches from most of the remainder of the supplies we brought from home or bought in Tonopah and pressed on. Around 4:30 PM, as the light was fading but before the sun actually set, we arrived at the Hyatt Place Hotel Albuquerque Airport. We'll be here for two nights, cashing in points that I earned mostly from Westercon 58, clear back in 2005 in Calgary, from hotel stays during the planning of the event and during the convention itself. [ETA: Per comments below, apparently not. Now I don't know where those points were earned.] I don't recall ever using Hyatt points on any hotel at all before, except for a planned stay on the way home from Nippon 2007 that we canceled (and recovered the points), and I'm sort of lucky to even have the points recovered and usable at a time and place that's valuable for me. 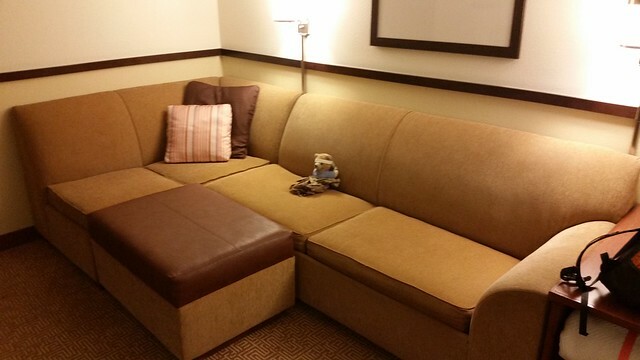 Our room is a kind of mini-suite, with a spacious living room (Kuma Bear is checking out the big sofa) including a wet bar and refrigerator (but no microwave oven). This view toward the sleeping area shows a work table situated in a way that actually allows Lisa to come and go without having to climb over me. After we got our luggage moved in for our two-night stay here, we headed over to the Waffle House for dinner. Low tastes, I know, but we like Waffle House. We then did a small drive around parts of Albuquerque that Lisa knew well from her college days here. 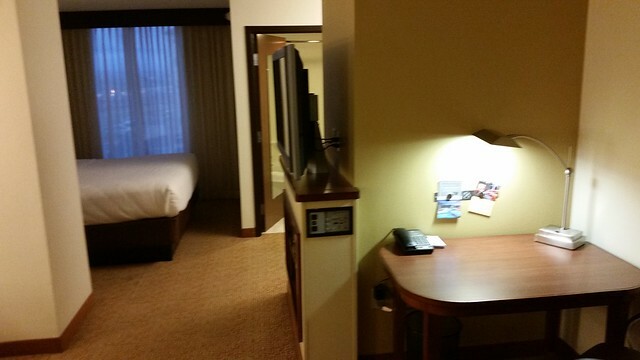 Tomorrow, I work remotely from here while Lisa goes and visits friends.